But this should have been obvious; it’s a huge hunk of meat. What could be more Germanic? 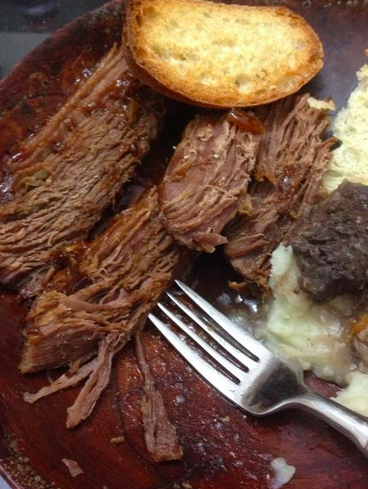 Many Jews who grew up in the West will recall brisket as a quintessentially Jewish cuisine. Molly Yeh at The Forward called it the “holy grail of Jewish food.” At a symposium at the Center for Jewish History in 2012 an important discussion took place about the greatness of this meaty item in the Jewish kitchen. But who wants an award? We just want to eat some meat. So there you have it. The history of this thing and the odd snobbish modern obsession with it. In Israel it can be acquired at most butchers and ranges in price from NIS 40 to NIS 80 a kilo or thereabouts. 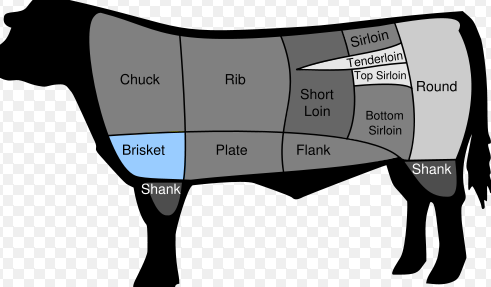 Many of us who come to Israel from abroad wean ourselves off brisket. Be honest – those Shabbat meals with so much food one wonders how one survived, and the requisite brisket that fits somewhere between gargantuan portions of cholent and who-knows-what… the brisket just sort of vanishes after a few years here. But we must all go on a brisket jihad; find the meat and convert it to something good. 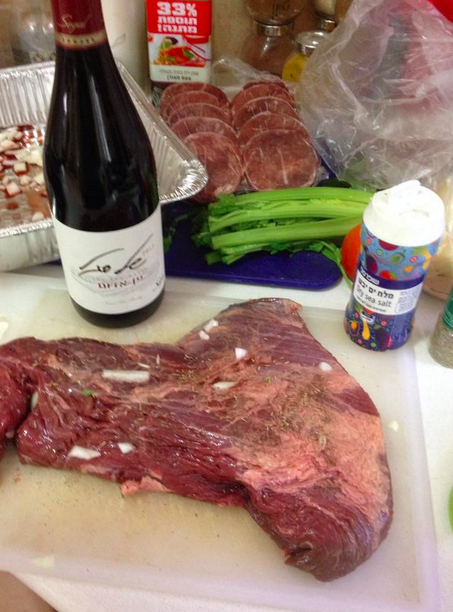 Some people marinate brisket for 12 to 24 hours. Don’t do this. First of all, since it has to be in the over for another four to five hours, preparing it 12 hours in advance means getting up at midnight to marinate it. No thanks. Instead, apply a dry rub of pepper, salt and thyme. Let it sit for an hour in the fridge. I, however, do not concur. Sear that bad boy. Meanwhile, pre-heat the oven to 180º. Remove the meat from the stove-top along with the onions and place in a large baking tin. When making the rub, keep in mind that all these wonderful, diverse ingredients are going to relax with the brisket for hours on end; combining for a wonderful taste. Be liberal in adding the ingredients. My recipe, passed down for part of a generation, is to combine a half a bottle of BBQ sauce, any store-bought regular variety will do, a quarter of a cup of grain mustard (any variety), a whole chopped tomato, several tablespoons of chili sauce (don’t use something too spicy), a dash of Bajan pepper sauce (any other spicy pepper sauce can be substituted) and a quarter of a cup of sugar. Lather the sauce all around the meat, making sure to rub it on both sides. It should be totally coated. If it is not, add more BBQ sauce. If you’ve got a glass of wine handy at about at this time (not necessary, but recommended), throw a dash on the brisket for good measure. Now take out the “secret,” or key ingredient: Coca-Cola. 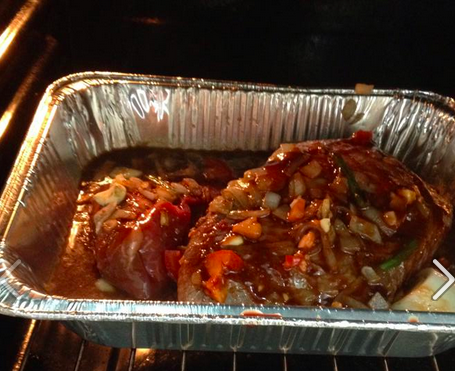 Pour half a liter around the meat so that it is resting in about 1-2 centimeters of soda. This may seem odd, but Coca- Cola is a wonderful thing for it to cook in because the sugar breaks down the meat. Chop up a whole tomato, half an onion and the bulb of garlic cloves and spread around and on top of the meat. Place the tin in the oven and cover it. Turn the meat over every 30 minutes for three hours. Turn down the oven to 100º and cook for the last hour or hour and a half. • Don’t use alcohols you wouldn’t actually drink. Some recipes want people to introduce alcohol into their food. Beef bourguignon and chicken cacciatore both require wine. Fine, we want wine in these dishes; it is an essential element. But cacciatore recipes also sometimes want us to go out looking for cognac. Just say no. Many other alcohols can be substituted, such as brandy (anyway cognac is a type of brandy), sherry or even whiskey. Why not throw some Southern Comfort in? Anis? Or maybe bourbon? • Never go out and buy a whole bottle of alcohol that you don’t normally drink just because of a recipe. Liqueurs are a great example. Unless you are one of those people that drinks this type of thing, never buy it. • Never flambé anything. The idea that waving a flaming pan around in your home is somehow good for anyone is ridiculous. • Never make bearnaise sauce. The ingredients alone should be a dead giveaway that bearnaise sauce is a waste of time and money: Wine, “champagne vinegar,” tarragon, shallots. No, no, no and no. • Remember hollandaise? It only requires butter, egg yolks and lemon juice. Neither sauce is particularly easy to make (requires a double boiler or some other contraption that keeps the eggs from “cooking” while blending in other ingredients), but why go to the trouble of finding wine and secret vinegars? • Don’t attempt roulades. Sure, steak roulade sounds like a great idea. First of all, it isn’t kosher because most recipes call for cheese. But even if this isn’t an issue, the problem is all the steps it takes to prepare something that may or may not be appetizing. It requires locating a piece of meat (flank steak usually); beating the meat out into a large pancake; making some other concoction with bread crumbs and other items; then rolling them into the meat and cooking it all again. Just give up. (And don’t even think about beef wellington, another impossible dish to do well.) • Any recipe that involves “truffle oil” or “creme fraiche” should just be torn out of the cookbook (think Robin Williams in the movie Dead Poets Society). • Make a whole chicken with orange juice, curry and soy sauce. • Make noodles and toss them with sesame oil, soy sauce, brown sugar and green onions. • Bake sliced potatoes with onion soup mix and olive oil. • Make onion soup: It isn’t as complicated or time consuming as people say.